Snooper 4ZERO Elite BT (Bluetooth) speed camera detector provides GPS, radar and laser detection and includes FREE speed camera subscription for the lifetime of the product. The camera database can be updated via a Windows PC, Apple MAC or wirelessly via a Bluetooth enabled device with data e.g. a smartphone or tablet. Buy accessories for the Snooper 4Zero Elite BT. 1 Year Guarantee with FREE UK delivery. Delivery in the United Kingdom (UK) is FREE on all orders over £50. Next working day delivery available for £9.99. For full delivery details please see delivery information. 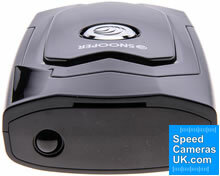 The Snooper 4Zero Elite BT (Bluetooth) is a GPS, radar and laser speed camera detector that will alert you to speed cameras in the UK and Europe and many other countries around the world (see the country list by clicking here). The alert range via GPS is up to 700metres. Laser detection can be up to 1 mile and radar is generally 1 mile away. Subscription to the GPS speed camera database is FREE for the lifetime of the Snooper 4Zero Elite BT device. However, you are required to register the speed camera detector product with Snooper for access to downloading the Snooper AURA GPS speed camera database. You can use the built-in radar and laser detector without registering. The 4ZERO Elite BT features Bluetooth technology for wireless connection to a compatible mobile phone or tablet device (Android and Apple devices). Once connected to a smartphone you can then receive speed camera database updates live, as you are driving (downloaded via your phone connection; data charges may apply depending on your phone charges). If you prefer to download the speed camera database at home or work then you can use either a compatible Apple Mac or Windows PC to update your Snooper 4Zero Elite BT detector. When using the Bluetooth to update if you are not connected to WiFi you may be charged for the data connectivity between the phone and the Snooper 4ZERO Elite BT. You should never operate the bluetooth database download whilst driving. On approach to a speed camera location within the GPS database the Snooper 4ZERO BT will alert you via a beep and spoken voice alerts. 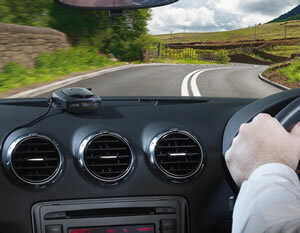 The radar detector not only alerts you to handheld radar guns but it also can tell you whether speed cameras are active. For example, Gatso speed cameras use radar detection within the camera enabling the Snooper 4ZERO Elite BT to tell you whether the speed camera is live and in use or not. Autoranging feature provides less distance of warning when driving at low speeds and more advanced distance warnings when travelling at high speeds. This is useful when driving on motorways and slow roads during the same journey. To be alerted only to speed cameras in your direction of travel Snooper 4Zero Elite BT has a Directional Alerts feature. 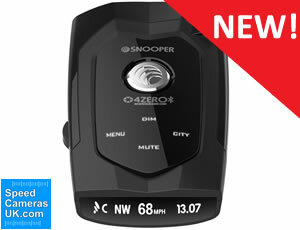 You may use the Snooper 4Zero Elite BT without the GPS speed camera database. This enables to use only the radar and laser detection of the Snooper 4ZERO BT. This may be a useful feature in countries where Snooper do not provide coverage via the GPS database whereby you can continue to use the devices other detection methods. Please ensure that you check with local and national authorities within the country you intend to use the Snooper in before using the speed camera detector. The OLED screen displays GPS signal strength, City Mode status, Electronic Compass, your vehicles speed and the current time. Set up is simply 'plug and play.' Included in the box is a cigarette lighter adapter, dashboard mount and windscreen mount giving you 2 options to mount the Elite BT in your vehicle. Manually set a speed limit and if you drive above this predefined speed you will be alerted. Control the volume of the Snooper 4ZERO Elite BT with the volume dial. Plus there is a mute button to receive no sound warnings. You can receive a reduced warning when driving below the speed limit. Simply turn on Smart Mute and you will only receive a visual alert. However, if you are driving above the speed limit you will receive both audible and visual alerts. This Smart Mute feature can be turned off whereby you will receive full (audible and visual) alerts for all speed camera locations. Auto ranging alerts are also included. 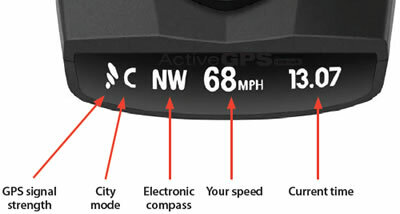 This feature provides warning a greater distance before the speed camera when driving on roads with a high speed limit and less advanced warning if driving on slow roads. There is a City Mode which can be switched on to reduce the number of false alerts from shop doorway sensors, shop and house burglar alarms and such like when using the radar and laser detectors. There is also a Motorway mode whereby alert volumes for detection can be predetermined. Not only will the Snooper 4ZERO Elite BT warn you of laser speed cameras targeted from in front of your vehicle it will also alert to laser guns targeted from behind your vehicle. Please note: The Snooper 4ZERO Elite BT is unable to detect in advance a mobile speed camera van/device using a laser or radar gun. The ONLY time the 4ZERO Elite BT can detect a 'live' and 'in-use' laser or radar beam is when one is in use and likely targeting your vehicle. In addition, if you are the first vehicle over the brow of a hill, round a bend, or simply the Police/camera operator is waiting for your vehicle to come into range, the Snooper 4ZERO Elite BT radar/laser detector can ONLY detect a live radar/laser signal when there is one to detect. The Snooper AURA updatable GPS database contains known fixed and known mobile speed camera locations. This is the best way to know in advance mobile speed camera sites. The radar/laser detector built into Snooper 4ZERO Elite BT will then warn if a live radar/laser gun/device is in actual use. Like all Snooper speed camera detectors and sat navs, the Snooper 4ZERO Elite BT gets its speed camera locations via the Snooper AURA speed camera database. Updated daily, the AURA database can be downloaded to the device via a Windows PC or Mac computer connected to the Internet with USB connection. It's important you regularly update, as the 4ZERO Elite BT GPS database is only as good as the last download. You can also update the speed camera database without connecting to a computer using the built-in Bluetooth. Bluetooth downloads are available when connected to a Smartphone or tablet device. There is an Android and an Apple App to download from Google Play or the Apple Store.If not connected to WiFi you may be charged for the data connection between your phone and the Snooper 4ZERO Elite BT. You should never operate the download of the speed camera database whilst driving. In addition to the UK and Ireland, the AURA speed camera database now offers Worldwide protection. Included in Snoopers database are locations in Germany, Holland, Belgium, France, Spain, Portugal, Switzerland, Italy, Austria, Luxembourg, Denmark, Norway, Sweden, Finland, Poland, Romania, Russia, North America, Canada and South Africa. 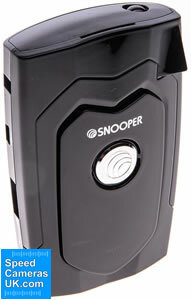 Snooper 4Zero Elite BT can be used as a standalone Laser/Radar detector in countries not mentioned above. Please check local laws on speed camera detection before purchasing. AURA database is available via FREE subscription from the manufacturer and there are no additional charges to pay once you have bought the Snooper 4ZERO Elite BT speed camera detection device. ‣Radar based devices including live Gatso and radar based red light cameras. Learn even more about the Snooper 4ZERO Elite BT by reading the manual. Please note: Windows XP (64bit) is not supported. Please note: Your PC/laptop must have a CD-Rom drive to be able to install the drivers from the supplied CD-Rom. If your computer/laptop does not have a CD-Rom drive, you can download the drivers directly from the manufactures technical support webpage here. Snooper 4ZERO Elite BT - What's in the box? If you require additional accessories for the Snooper 4ZERO Elite BT these can be purchased via the Snooper 4ZERO Elite BT accessory page. Pictured below - windscreen mounted and dash mounted Snooper 4ZERO Elite BT, both options are included in the box when you buy the 4ZERO Elite BT from SpeedCamerasUK.com. Please note: The Snooper 4ZERO has no internal battery and cannot be charged or powered indoors by PC or AC mains charger. Question: Does the Snooper 4Zero Elite BT take an external gps antenna, it is not clear with all my reading up. If so what's the price for the antenna? Answer: The Snooper 4Zero Elite BT does not have the ability to plug in an external GPS antenna, the connection for one does not exist on the unit. The only speed camera detector we sell with a connection for an external GPS antenna is the Cheetah c550 Platinum. We sell the Cheetah c550 and GPS antenna online our website SpeedCamerasUK.com. Please see the following webpages: Cheetah c550 Platinum and external GPS antenna. Question: Can you please clarify the 'Red Light' Camera detection of the 4 Zero Elite BT? Answer: Snooper does not include red light cameras in their GPS speed camera database. There is however an exception to this and that is when a camera has combined technology - Red Light Camera and Speed Camera in the same housed unit. Please see page 10 of the Snooper 4ZERO Elite BT manual to read more. If you require a speed camera detector to alert you to ALL red light cameras, the Snooper 4ZERO Elite BT is not the device to buy. The detector to purchase is the Cheetah c550 which does include red light cameras as well as speed cameras in the GPS database. Question: Is the lifetime subscription transferable on the snooper 4 zero elite BT if you sell the device? And how would the transfer work? Answer: The Snooper 4ZERO Elite BT subscription cannot be transferred from one Snooper 4ZERO Elite BT unit to another Snooper 4ZERO Elite BT unit. The free lifetime subscription comes with the unit - the units unique serial number when purchased from SpeedCamerasUK.com. For change of ownership please talk to the manufacturer when you register your Snooper 4ZERO Elite BT for a definitive answer. Question: Does the snooper 4 elite bt read handheld cameras whichever side of the road they are on? Where I live they hide behind walls and get you from either side. I was caught last week speeding and the bike cop with the camera was on the opposite side of the road and 266metres behind me. 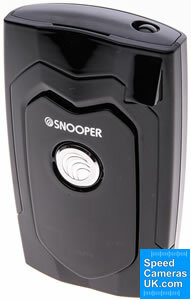 Answer: The Snooper 4ZERO Elite BT features a forward and rear facing radar and laser detector. It will detect radar and laser based cameras e.g. Gatso and handheld radar guns in front of your vehicle, behind your vehicle and on either side of the road. For the optimal performance of the Snooper 4ZERO Elite BT built-in radar/laser detector it needs to see the road ahead of and behind your vehicle. 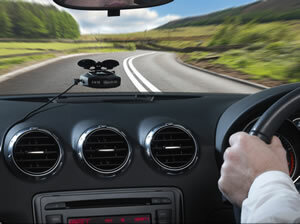 The best place to position the Snooper 4ZERO Elite BT is in the centre of your vehicles windscreen low down, but high enough to see over the windscreen wipers/bonnet and out the rear window over your vehicles parcel shelf. Question: I'm not a person that would manage the updating of the detector that easily but would be happy enough to use the Snooper 4 Zero Elite BT as a detector for manually held speed guns as this is my biggest woe!!!!! My question is not being that technical how easy is it to get it to work i.e. from taking the Elite out of the box how much do I need to do to get it operational is it easy? 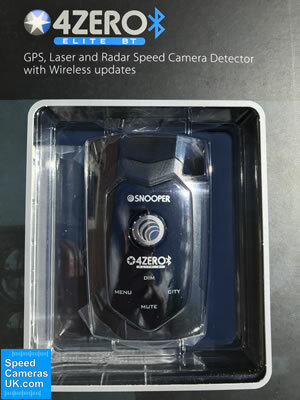 Answer: The Snooper 4ZERO Elite BT radar and laser detector will work straight out of the box. If you are not intending to use the GPS database of speed camera locations, you will not need to register or download anything to the device. Question: How does the snooper 4 elite bt get power? Is it with the cigarette lighter socket? The straight power lead plugs directly into your vehicles cigarette light socket. The hardwire power lead can be hardwired to your vehicles electrical supply. We recommend using the services of a qualified auto electrician for hardwiring. To submit your question please click here. Once you've found the sat nav, speed camera detector, other electronic device or accessory that you'd like to purchase you can buy online using a debit/credit card or via PayPal. We use SagePay to process our online payments who are PCI DSS Level 1 compliant, so you have total peace of mind with your personal and payment details. All of our products are sophisticated electronic devices which requires that you read, understand, and act upon the information given in the instruction manual (usually available via the above 'manual' link). You will need internet access and, in accordance with the manufacturers’ recommendations, regularly seek out and accept all firmware or software updates offered by the manufacturer. All GPS devices need to ‘see’ the satellites in the sky. Therefore you will need to know that your vehicle does not have glass that will block or impede the GPS signal. The same advice about vehicle glass applies to radar and laser signals.